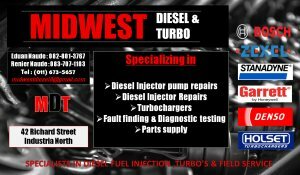 We repair most type dieselpumps and injectors on passanger vehicles, trucks generators and eartmoving equipment. VP44: MAN M2000 LE280 Truck Range. VE4 Type pumps for most Toyota Bakkie and Fork Truck engines. Denso ECD V4 Pumps to fit to Toyota KZTE Bakkie and Prado and 5LE Engines. Denso ECD V3 Pump to fit to Land Cruiser 120 series 6cyl engine.